Talk With Steven is a forum for cycling fans and interested individuals to submit questions to Steven. Just click Submit Questions to send your questions to Steven. Steven will select questions and answer them through video or script. These will be posted for fans to enjoy. If Steven Cozza, made his bones racing in Italy and Europe as a junior, born to a family of Italian heritage in Petaluma in the Sonoma valley in Northern California on March 3, 1985, Steven will turn 26 in a month. Cozza started racing Laura Charameda in 200 Team Swift Junior Developmental Team and progressed in the next 3 years racing with Danny Van Haute in in Europe with the USA Junior team at the age of 16 and in Belgium with the USA U23 team. His progress has been steady since. 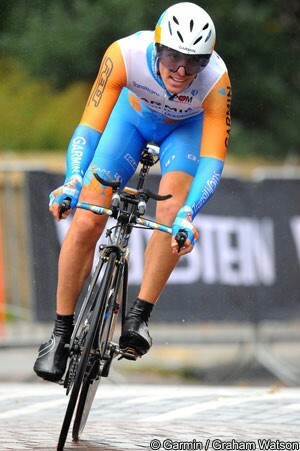 He joined Jonathan Vaughter’s development team TIIA Cref at 20 years old in June of 2006; and stayed with the team through its evolution from – Slipstream-Chipotle (2007-08) to ProTour outfit as Garmin-Slipstream 2009 and Garmin-Transitions 2010. Last fall signed with Div II team NetApp based in Hamburg, Germany sponsored by the American company NetApp, that creates innovative storage systems and software. His best successes came in 2007 when he won a stage at the Volta Chiahuawa in Mexico as well as a year later at the Volta a Portugal and the Tour of Missouri where he won the Best Young Riders classification. Of course we shouldn’t miss that he stood on the top of the podium with his Garmin teammates after after winning team time trials and was the top American (23rd) at the World Championships in Varese, Italy in 2008. Steven is a talented all-rounder. a more than able climber, capable of a fast time trial and an aggressive rider at home in breaks in a one day classic or stage races. Cozza has gained invaluable experience in the past eleven years that will be an invaluable asset to the NetApp team in 2011 as he steps into a leadership role. Vaughn Trevi: So having met your team mates at this point how is the ambience at the camp? Steven Cozza: The team is great. I am really happy racing here at NetApp. The entire group including the staff and management all have respect for each other. I think to produce a successful team the riders must respect each other but more importantly respect and get respect from the boss. With this kind of atmosphere we are all prepared to go into battle as one and leave no man behind except for the competition. Photo © 2011 Mark Adkison Ph.D. V.T. : Who are your favorite riders to train with? S. Cozza: I enjoy training with the entire team. I live in Spain and so does Jesus Del Nero so its fun having that in common with someone on the team. I’m also Italian by blood and Cesare on the team is Italian. That is also pretty cool to have an Italian teammate. There’s 8 or so different nationalities on this team. Pretty cool. V.T. : ow is your early season training going? How are things going at camp for you and the team in Mallorca this week? S. Cozza: Training this early season has gone great. My coach Dario Fredrick from Whole Athlete works closely with me and always gives me a great training program. VT: Do you plan on coming into the season with a roar or aiming to peak at the tour of California now that the team has been confirmed? S. Cozza: I definitely would like to start the season off on the right food. My goals for the early season are het Volk, 3 days of De Panne, the tour of Turkey and of course the Tour of California. VT: When I hear your name I remember your aggressive riding and activity in breaks… a guy who is willing to go for it all in the long break with a group as as you did with new team mate Jan Barta at Paris-Bourges or your solo pursuit of a break at the tour of Romandie in 2009… and of course a mustache. This may sound stupid, but what keeps you motivated out there in that situation? S. Cozza: I do enjoy racing aggressively. For one its the best way to get stronger. You also can create a lot of opportunity for yourself this way. I enjoy putting on a good show for the fans. We are entertainers after all. I get the most satisfaction from racing my bike hard and I will continue to race this way till I stop cycling. V.T. : Do you just like to be out there making the race instead of sitting on? S. Cozza: Ya for sure. V.T. : Will you have more opportunities like these this year with team NetApp; can we expect more of the same bold moves this season? S. Cozza: Ya I believe so. It all depends on my head and legs. I want to win some races this year and its not going to be beating cavendish in a group sprint so I have to be a little more creative. V.T. : What is your favorite European Race? American Race? S. Cozza: I raced Amstel for the first time last year and really loved it. I’d have to say I enjoy any race I can do. V.T. : The one race you would like to win in the future. S. Cozza: Any of them sounds good to me. V.T. : If you had to describe yourself as a rider and your talents how would you do it? S. Cozza: I would say I’m a Bold cyclist that creates his own opportunities. I’m ready to tap into that again this year. V.T. : Do you have a rider in the past that you admire and would like to emulate during your career? A current rider. S. Cozza: Jens Voigt is pretty dam hard to beat. If I can be half the cyclist he is I’d be pretty dam proud of myself. V.T. : Do you think that most cycling sites and mags are too fixated on doping that they fail to report good or worthy news like your Giro Bello benefit ride to the detriment of cycling? S. Cozza: Ya of course. I think its important these sites bring light to what’s going on because we must not ignore such an important issue but hey come on, don’t need to beat it into the ground. It gets old and repetitive. Report on positive things to please like my www.Girobello.com charity ride with 100% of the money raised going to two very important causes. V.T. : Do you feel they do justice to riders and teams involved, or are the too often fixed on lies and rumors? S. Cozza: I think the majority of the stories reported are twisted and distorted. Accuracy is very far away from the bulls eye. Yes on the lies and rumors; that’s exactly what they are. V.T. 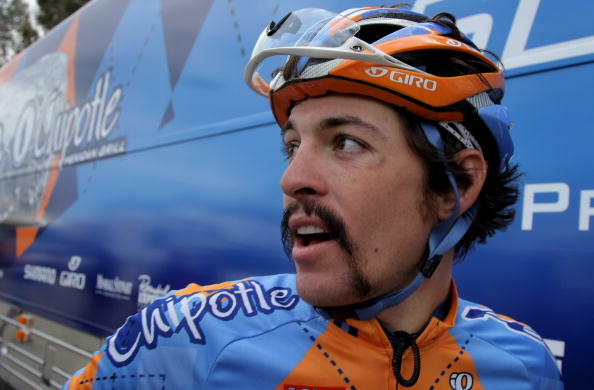 : Give me the good, bad and ugly about being a pro cyclist? S. Cozza: The worst thing about Pro Cycling is I have to live so far away from my family. The 2nd worst thing is I can’t own a dog. And the best thing about it is I get to live my dream. The day its not my dream anymore you won’t hear about me know more. I do have some pretty cool plans for when cycling comes to an end one day. V.T. : You do a lot of work for causes on your website, Giro Bella Ride, Race for Kids Fan Club, and you Fun for Kids section… I see there is another side to Steve Cozz most might not be familiar with. Did your coming up on the Team Swift program influence your doing these activities for kids? S. Cozza: I’ve always loved giving back and helping others. I believe as humans it is the rent we pay for living on this planet. We must do all we can to help others. Its our duty from the day we are born to the day we die. V.T. : Tell us a bit about your Simplon bike you and the team will be riding. S. Cozza: The Simplon bike is hands down the best bike I have ever ridden. I’m not just saying this because its my teams bike. Its Austrian made and just rides and handles incredibly. Its incredibly stiff yet absorbs all the bumps in the road. V.T. : Thanks Steven for making the time for this interview while you are at camp. One last thing, will you be riding the Giro Bella in June? S. Cozza: Yes, I will definitely be there. I’m going to be doing the 200 mile route. There ya go folks you’re invited to join Cozza on a good long ride on roads he trains on hrough the beitoful Sonoma County wine country, the Bodega Coast, the Geysers and more, all to benefit Rotary’s Polio Plus eradication program and the Institute for Myeloma and Bone Cancer Research aim to cure blood and bone cancer. Don’t forget to wear your mustache! A new video of Steven riding on the roads with more details has just been posted on the Giro Bella site with more details of the ride, dinner and expo. Steven may have other pro riders as guests on the ride so stay tuned to the DP for further announcements and register for the ride and book your hotels soon. Liam: Best and worst thing about being a pro cyclist?? 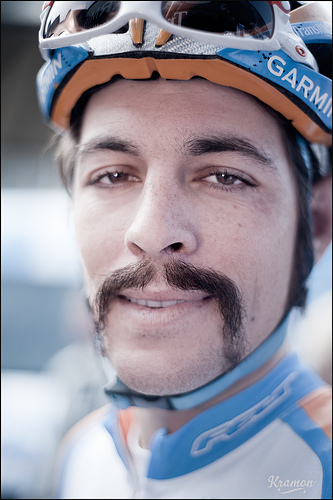 Steven: The best thing about being a pro cyclist is I get to ride my bike for a living. Worst thing is I am away from my family and friends for long periods of time and I can’t own a dog. Liam: Are you ever on a climb and think about getting off and kicking the bike to pieces? Steven: No Never, only the guys bike in front of me. Ha. I love my Simplon bike and would never kick it. Liam: If you weren’t into cycling , what sport would you play? Liam: What would be your top piece of advice for all amateur cyclists ? Liam: You Live By your saying “never give up”. Has there ever been a time you have said enough is enough? And what makes you “NEVER GIVE UP” ? Steven: Yes. Quitting is not an option and I won’t ever give up. As long as you give it your very best even in defeat you can feel proud that you never gave up and did your very best. Like my Never Give up wrestling video, I was the underdog. I was about to be pinned and I gave it one last effort and won the match. We all face challenges in life many times over. I like to encourage others to never give up no matter what obstacle they face in life. Liam: What Bike do you Love to Ride? Steven: Neither. The question we should ask is: Can one live without the other? No. They need each other to exist. Just like we as people need one another to exist. Liam: What is it like at Team NetApp? Liam: Favorite race of all time? Liam: Greatest win of your career to date? Steven: My only win as a pro cyclist was a stage at the Vuelta Chihuahua Internacional, Mexico. So that would be my favorite win. Liam: What age should kids start Racing ? Steven: When they choose to race. Liam: Do you support any NFL or Basketball Team if so who ? Steven: No, but I am a fan of the San Francisco Giants. Liam: Who is the Biggest Inspiration in your life ? Liam: All time greatest Cyclist ever ? Steven: The ones who choose to race drug free. Liam: Ever been to Ireland ? Steven: No, but would like to visit some day. Liam: Kelly or Roche ? Liam: How has your family influenced your sporting career? Steven: They taught me to believe in myself. Steven: Very cool. It’s our responsibility as human beings on planet earth to help others. It’s the rent we pay for living on earth and Cycle 4 Sick Children is doing this. To be able to ride your bike and help others is a great thing. Liam: What is your up take on riders caught doping ? Steven: It’s sad, but with everything in life you have people who lack integrity and will do anything for their own personal gain. They don’t care how others are affected or how they hurt the sport of cycling. This 25-year-old Garmin-Transitions rider is truly something special. And it’s an honour for me to be allowed to portray him as ‘Rider Of The Week’. There might be a lot of you that have never heard of him, and some who only know him for his moustache, but this week we really get to know the person behind the rider. At just 12 years of age Steven took a stand against discrimination within the Boy Scouts, and started an organisation, Scouting For All, to change their policies. From the age of 12 – 15 he spoke all over the USA against discrimination, and still goes to schools during the off season to speak to youth about standing up for what you believe in. When he made it into the professional world of cycling, he decided to start the ‘Race For Kids Fan Club’ where he aims to raise $1 million for children all around the world. It’s not a charity where the money goes just one place; you can choose which childrens charity you want to donate to. ‘Race For Kids Fan Club’ keeps a total of all the money donated to all the different charities. I thought this was such a fantastic initiative by Steven, and decided all the money we raise for Right To Play will go towards the total. What got you interested in cycling and when did you start? I started off racing BMX. I worked for an old guy taking care of his garden for a year and bought my first racing bike that way. Then my friends got me into mountain biking. I started off by taking my mom’s mountain bike, but then got in trouble for taking it on the trails without permission, so my parents got me own for my 13th birthday. I started racing on the road in ‘99, the year Lance Armstrong won his first TDF. He really inspired me so I got a road bike. Well I had to also ride on the road due to a broken shoulder I sustained in a high school wrestling accident. I never went back to racing mountain bikes or wrestling after that. What have you sacrificed for cycling? I have sacrificed a lot. The greatest sacrifice is not being able to live by my family, but instead across the world. For the most part though, the sacrifices have been all totally worth it. Following your dream is the best thing you can do in your life and I want to encourage all kids to continue to follow their childhood dreams. My biggest achievement is coming back after every time I’ve been knocked down. Breaking through every wall that’s put in my way and never giving up. Do you look up to anyone? Who, Why? Yes, I look up to Muhammad Ali. He is the greatest athlete ever – in and out of the ring. What a champion – to not only be the greatest athlete of all time, but also a great human being, always standing up for others and never looking down on people. He is the greatest. What would a perfect 2010 season be for you? The perfect season would be to race to the best of my ability and to help my team the best I can. Which 3 things would you change about cycling? I’d make more races in other parts of the world. Which 3 things make you proud to be a cyclist? I’m proud to be a clean cyclist. I’m proud to stick to my beliefs. And, it feels good to be a good role model for kids. If you could invite 5 people to a dinner party (dead, alive, or fictitious) who would they be and why would you like to invite them? What is your favorite race of the season? Paris-Roubaix. I love this race because it’s so different than the rest. Which race would you most like to win? Paris-Roubaix. What is the reason you wanted to start Race for Kids Fan Club? Because I like helping others rather than just myself. All children deserve a chance in this life. We can all make a positive difference. Right To Play already has projects in 23 countries worldwide, but where do you think sport and play could do the most good for young people and society as a whole? I think it’s important to give all youth in the world these opportunities. Sport is such a great activity. Competition used in a peaceful way. It teaches kids so much and should be available to all. Thanks to Right To Play, they are paving the road to making this happen. Why do you think it is so important for children to have the opportunity to participate in sport and play? It’s good for everything: health, teaching responsibility, teamwork, building confidence and self esteem, encourages friendship and so much more. Sport/Play and Education are crucial in the development of a young person’s life. If you want to support the fundraising, and also become a member of the ‘Race For Kids Fan Club’, you can donate to Right To Play here, or bid for items in the auctions that will be on ebay. Thanks so much to Steven Cozza for taking the time to answer the questions! Good luck with the season, and of course with the amazing work you do for all the children in the world! And thanks to Kristof Ramon for the picture. As fans we frequently commodify athletes — attach labels to them to indicate their value. My favorite example, as a Red Sox fan, is the discussion of who is the team’s “ace,” or top starting pitcher. Recently, reporters who should’ve known better asked Josh Beckett, a notoriously prickly dude, about it, and he responded with palpable disdain. Didn’t answer at all. And I can sympathize: not only the lack of sympathy for Boston sportswriters but the concept — what does that label mean to him? Why would the identity of yesterday’s pitcher matter when today it’s his job to find 27 outs someplace? We fans do this in cycling too — and it’s not “bad” or even always wrong. The results justify our “sprinter rankings” discussions or predictions of who will win Paris-Roubaix or climb up a grand tour podium. In the sport’s rarified air, you can find guys commodifying themselves as “captains” and protected riders. Hell, last year we even enjoyed the distinct pleasure [cough] of watching Lance Armstrong and Alberto Contador wrestle each other for the label while their DS vainly insisted that it didn’t matter. PdC: Generalizations are bad, but among the European peloton are the classics guys known for any particular traits of personality? SC: Yes, Classics guys tend to be very very mean. We are not like those wimpy French stage race guys out there. Us Classics guys have mustaches and chop firewood for training. For example, I ate rattlesnake for dinner last night. I’m gluten-free, so rattlesnake is one of my favorites. PdC: So you recently said that you dream every day of winning Paris-Roubaix but your website lists climbing and time trials as your strength. At this early age are you trying to figure out where you best fit in? SC: You know I try never to count myself out. Why put limitations on ourselves? There are too many jerks already out there telling us negative things and my ears are closed to all of them. You just got to believe in yourself. Anything is possible. PdC: It sounds like in your heart you’re a classics guy. So how did you become a “classics guy”? How far back does this connection go? SC: I like the Classics and see myself going far with these races, but I just love racing my bike and the harder the race is the better it is for me. This is why the Classics suit me so well. PdC: Staying with Paris-Roubaix, last year was your first full-on running? Had you raced over those cobbles before turning pro? SC: I’ve raced since I was 17 in Belgium. I have spent many years racing over those cobbles and absolutely love it. PdC: So being in a long break [Cozza was part of a lead group at the 2009 Paris-Roubaix], was that like being a kid in a candy shop? What did you think about it? SC: Yes, it was. I was very excited. It was a really hard break to make in a cross-wind section. It was like having a front row seat at the movie theaters, except I was in the movie. I love every minute of Paris-Roubaix because of the challenges it presents. There’s never a dull moment, that’s for sure. PdC: In a race that long and difficult, did you have hopes of staying away? Or did you think, it’s Paris-Roubaix, we will be chased down? SC: Yes, of course. It’s happened before and it could happen again. You just never know. I wasn’t in the break just to be in the break. I was in the break that day to try and win that freakin’ race. I want to be the first American to top the podium one day. Those are larges ambitions, but you’ve got to dream. PdC: To finish after being in the break was a real accomplishment. How close do you feel to being strong enough to competing in P-R? SC: I feel I can already compete in the best races in the world. Ive had quite a bit of injury and bad luck over the past year. When I put all this bad luck behind me I’m going to come out swinging. PdC: Are you hopeful of a spot on the team’s Tour de France roster? Is that a pretty big key to your development? SC: Yes, I would love to race and be competitive in the Tour de France someday. It’s something all pro cyclists want to aim for. PdC: What do you do to train for the classics? Do you head up to Belgium far enough ahead of time to get in some training? Or is the plan to keep racing, generally raise your fitness and see where it gets you? SC: It’s a little of both. It’s very important to get some long kilometer days on the bike. After some of the 200k race,s we will go out for another 50k just to be ready for Roubaix. Since I am nursing a broken clavical that I had operated on after my crash in Qatar, my approach is a bit different. Long training days and motorpacing until I can race again. PdC: Are there places around Girona that help mimic the climbs of Flanders or the Pave of northern France? SC: No. Nothing can mimic these climbs. You have to go there to train on them to really be great. PdC: You’ve mentioned climbing as part of your arsenal. 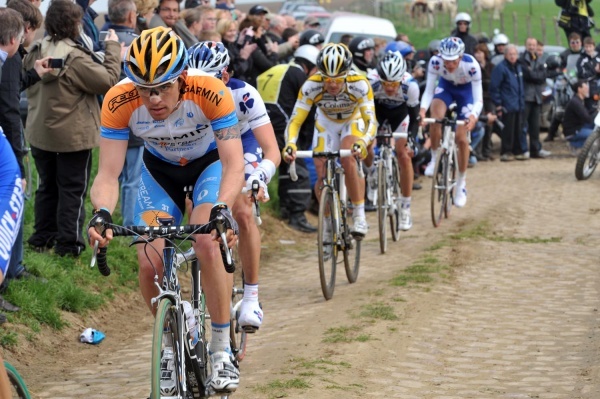 Did you get a sense of the Tour of Flanders and whether that might be a better race for you? SC: Flanders has short steep climbs in it. You don’t need to really be a pure climber which I am not. The Flanders climbs are perfect for me and I really enjoy this race as well. I think I can ride very well in Flanders in the future. PdC: Between P-R and Flanders, how are the rhythms of the race different? SC: They are actually very similar. The best guys use the cobbled sections to make the selections in both races. It’s just that one race has short, steep cobbled climbs and the other does not. PdC: Right now you’re a young rider on a team that’s put together a front-line Classics team. I gather your job (if you’re healed) is to support them? SC: I’m 25 years old. I wish I could still use the ‘I’m young’ comment, but I am half way to 30 now. Whether I’m riding in support of my team or taking over a lead roll, I don’t really care. I just love to be able to do my job on the bike whatever that entitles. When I’m given a clear mission, I give it 100% no matter what it is in the race. PdC: But you have ambitions to win P-R and presumably others. So how do you get the team to give you a chance? By getting results elsewhere? Driedaagse West Vlaanderen, de Panne, Eroica, stuff like that? SC: Yes, that and to be there if something happens to our leader to take over the main role. PdC: In what races do you expect to have more of a leadership role? SC: When you are going the strongest you get the leadership role. That’s just how it works. PdC: Do you worry at all about people thinking of you as a domestique? Is there a danger that guys get “labeled” by doing good support work? Or are these labels and distinctions just something for people outside the sport? SC: No not at all. There are 200 guys in a bike race. Not everyone from every team can fight for the win. Teamwork really is important in winning a bike race and if it wasn’t for the domestiques, the leader would never win. It’s just how it works and to be a great domestique is a great accomplishment. Not every guy can do the work of a great domestique. PdC: The collarbone — what’s the prognosis now? What kind of training do you do to preserve your fitness? SC: Three weeks on the trainer and now back on the road. My first race back is Volta Catalunya. For more up-close updates, check out my web page at www.stevencozza.com and join my Race For Kids Fan Club while you’re at it. Do check out his site. He writes well, with candor, and is passionate about his charitable work. He also talks about his hectic life lately, which (along with a non-functioning Skype connection) is why we did this by email rather than the preferred, more conversational phone interview. Guy’s got a lot on his plate as he struggles to get race-fit as soon as humanly possible. Couple things I found interesting. First, following up on my opening theme, he makes a good case for shedding labels. After our discourse I have started to see those “I just wanna race my bike” comments you see all the time from riders not as banal but as sincere attempts to explain that racing isn’t about commodities. Everyone is a bike racer racing his bike, whether he’s asked to take a leading role or a support one. I should know better — the team concept of cycling isn’t exactly new to me — but chatting with Cozza is a nice reminder that the athletes don’t typically categorize themselves. Performing at such a high level requires a ton of hope, including for many guys the hope of winning the big race someday but in the context of teamwork, where everybody’s contribution is valued more or less equally. Cozza’s goal is to be one of those guys, do everything he can, and see where the chips fall. I was also a little surprised to hear him say that 25 isn’t young. Obviously he would know more about this than me, but it’s worth wondering whether American riders can be held to the same standard as Europeans (for whom 25 is at most just entering their prime). Even guys like Cozza who went to Europe straight from high school still don’t tend to have the background in racing that the homegrown riders there do. Look at Tyler Farrar, who started really putting together his immense talent at age 26. 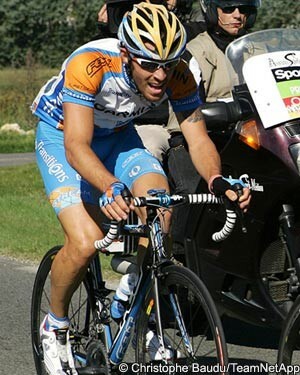 Or Christian VandeVelde, who “exploded” onto the scene at age 32. Or even Armstrong, a wet-behind-the-ears World Champion but not a Tour de France winner until his late 20s. Cozza may believe it’s getting close to now-or-never, but I’m not so sure.